Having lunch at Facil (one-star Michelin, 16 points GaultMillau, and four cutlery) on a sunny day in Berlin was pure magic. 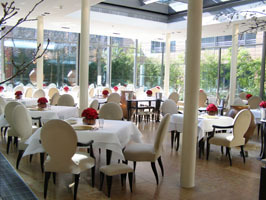 Facil opened in 2001 in the trendy Potsdamer area, where the cuisine is described as pure luxury and modern avant-garde. The restaurant, located on the 5th floor of the Mandala Hotel, is a stunning oasis in Berlin. Imagine sitting outside at a table in the bamboo garden lined with white stones, where the bamboo trees dance in the breeze, and when the Japanese trees are in full bloom, it is hard to remember that you are in a bustling capital city. Inside, the restaurant is quite impressive with glass walls and a glass ceiling looking out onto the bamboo garden. The restaurant features modern, elegant, contemporary décor with stunning elements of honey-colored natural stone floors from Italy, ivory colored columns, and two terra cotta urn fountains set on small stones in the center of the restaurant that add audio interest. Semi-polished mahogany, light grey marble, artistic Donoghia chairs with wheat colored fabric and dark wood arms and legs add contrast, while large branches with the first of spring's buds in a tall vase added a touch of the season in the entry, and large vases with whimsical branches laden with round faceted crystals sparkled in the bright sunlight inside the restaurant. The tables were impeccably dressed with white linens and accessorized with large gold charger plates, stunning clear and gold ribbed large round vases holding two dozen red roses, silver from Robbe & Berking of Germany, and water glasses from Thailand. Edward F. Nesta and I had an excellent lunch at Facil in March 2007, which demonstrated Chef Kempf's imaginative talent, beginning with the Amuse Bouche of a tasty soup of Red Root Vegetables and Potato with Spicy Apple Chutney, Smoked Duck and tiny, diced pear presented in a shot glass with a potato crisp "cap" with the smoked duck on top (for Edward) and the spicy apple chutney on top (for me). Sommelier Felix Voges paired the Amuse Bouche with a glass of 2004 Wittmann Silvaner "S" Trocken with a deep gold color, white peach nose, with white peaches, and an earthy, mineral finish for Edward, and a glass of 2005 Clos de Blanchais, Mentetou-Salon, Morogues with a pale gold color, with a light nose of green apples, with a crisp, dry, and refreshing finish, for me, both of which were perfectly paired. Chef Michael Kempf next sent us a "Greeting" of Dorado with a nice salt crust on a bed of sautéed lettuce and fish sauce to accompany the selection of three breads presented with small bowls of cottage cheese mixed with herbs, tuna dip, medallions of butter, and a bowl of sea salt. For our first course, we had Spiny Lobster with Vegetable Salad and Crisp Cannelloni and Tarragon Sesame Sauce that was absolutely gorgeous. The lobster was presented on a bed of julienne vegetables with shellfish foam, and the crisp cannelloni made from a puree of potatoes was filled with shellfish and béchamel sauce. As his second course, Edward had Slices of Veal Shank with Squids, Shellfish Cream and Coriander, presented as a cold dish with two disks of veal shank, and marinated calamari on julienne vegetables, with two lines of coriander pesto. For my second course, I had a selection of vegetables of shiitake mushrooms, snow peas, and carrots, with pretty coral foam. 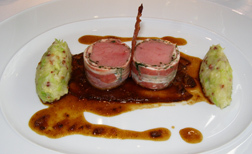 The courses were artfully presented with a taste on the palate to match. Edward continued with Two Variations of Bigorre Pork with Amalfi Lemon Sauce, which arrived as two tender pork medallions wrapped in pancetta, thinly sliced braised pork belly and potato with cabbage with a crispy pancetta "feather" placed between the two disks of pork with a sunny lemony sauce. I continued with Red Mullet with Tomato Bell Pepper Compote and Poularde Sauce, which was another colorful presentation. The fish was presented with a sprinkle of white flake sea salt from Portugal, with a saffron yellow sauce, light and dark green zucchini, bright red peppers, and orange mussels. This was an especially nice dish with the complement of textures with the crunch of the zucchini paired with the tender red pepper, and the mullet with the sauce. This course was paired with a 2001 Achkarren, Schlossberg Grauburgunder, Auslese, Dr. Heger, made from 100% Grauburgunder, with a sweet nose of honey and melons, with a lively acidity and a fruity finish. From our table, I had a direct view of the glass doors that opened into the kitchen, where I watched completely fascinated as Chef Kempf created each course. 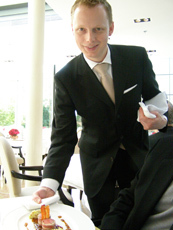 The service at the restaurant was also excellent under the skilled direction of restaurant manager, Manuel Edwin Finster. The dessert course was a medley of a light honey mousse with orange jelly, tiny mint leaves and a spear of Florentine cookie; the warm semolina pudding with brittle cashew praline was a definite "comfort food"; and sour cream vanilla ice cream was a nice contrast to the accompanying sweet fruit. Paired with a 2005 Keller Monsheimer Silberberg Rieslaner, Auslese with a fresh, slightly sweet, ripe white peaches nose and on the palate, the dessert was wonderful. As a final "parting" dessert, Chef Kempf sent us a rich and buttery tiny square of apple cake with a crumbly crust paired with a quenelle of espresso ice cream. We ended lunch with an espresso and green tea presented in a white porcelain teapot placed over a warming candle. Read about Facil in the Chefs' Recipes sections where Chef Kempf, the youngest star of the one-star Michelin restaurants in Berlin shares a few recipes. in English and German.